Marine Insurance is what must come to people’s mind when they think of insurance related to trade. It is an insurance that indemnifies losses incurred from destruction or damage to exported or imported cargo during the voyage. For example, when cargo is destructed or damaged because the ship sank or was destroyed by fire en route, the loss will be indemnified. In comparison, Trade Insurance covers risks that arise from trade transactions and overseas investment which are not in general covered by marine insurance. This system developed at an early stage in Western countries including the United Kingdom, in countries which are highly dependent on trade. It is also called Export Credit Insurance or Export Credit Guarantee. Investment Insurance which covers risks involved in investment is relatively new compared to insurance of trade transactions and the system spread to other countries of the world from the United States. Summary video of Nippon Export and Investment Insurance (NEXI) and how it operates in Japan. Try and insert the caption from the YouTube video here. 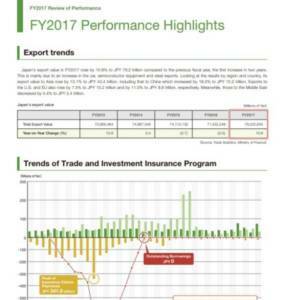 What types of products and services does Nippon Export and Investment Insurance (NEXI) offer in Japan? Trade Insurance covers risks that arise from trade transactions and overseas investment. This system developed at an early stage in the Western countries including United Kingdom, in countries which are highly dependent on trade. It is also called Export Credit Insurance or Export Credit Guarantee. To conduct business activities for insurance against risks arising in external transactions for which ordinary insurance cannot provide relief. Get in touch with our ECA finance experts. Enquire now.